Dolph Lundgren, star of 43 movies (five he has directed), is easily one of the most underrated actors/directors in Hollywood today. Far too many people brush him off as merely an "action movie guy," when in fact the man has clearly demonstrated his wide range of acting abilities in many of his movies. Granted, he's made a lot of action movies, and playing the role of the "tough guy" is what he does best, but you'd be wrong to simply characterize him as solely an "action movie guy." From his first big role as the brutal Ivan Drago in Rocky IV through to the formation of his own production company, Red Orm / Thor Pictures, and now directing his own films, Dolph has proven himself as a mainstay in the movie business, and he continues to put out great movie after great movie. With his formidable frame and his ability to truly project the character he is portraying, his presence on the screen is always excting to behold. Dolph Lundgren is actually one of the most interesting actors in the action cinema, but he has been overlooked in favor of other action stars for the past 10 years. Both the audience and the critics looked down on him and his films remain unknown from mainstream moviegoers, while he's still considered as a star. Yet, he always played characters who are not the average straight or bad action guys. He tried to humanize ambiguous and dark characters like in Red Scorpion or The Punisher. The thing is that he didn't want to be an action hero. Unlike his colleagues Jean-Claude Van Damme or Steven Seagal, Lundgren never tried to make a name for himself into the big studios (nor has he ever been nominated at the Razzie Awards!). He refused all the sequels that he was proposed and he developed projects of his own through his production company (successively called "Dolphin", "Red Orm Productions" and "Thor Pictures") but unfortunately most of all fell down (like dramatics features Nightclubbing or Still The Drums). "It's all "showbusiness" in LA. People are so fake. They only think about money, parties and success. They probably are saying, as we speak, what a has-been I am! That's part of life and of course I worked to pay for a nice lifestyle, but now I've set myself the challenge to find different things like work in small plays off Broadway and learn how to act. I was a movie star before having a chance to become an actor, so now I'm going to backtrack. I'm persistent. If I want to get somewhere, I get there." "Of course I will still do movies but now I'm seeking different roles. I'd rather have a supporting role in a good picture than be your all-action man. I'd rather star opposite a French actress like Julie Delpy than a Hollywood goddess like Sharon Stone." Dolph said to Film Review magazine (Sci-Fi Special #14, February 1996). He involved himself in some interesting personal projects that could have shown more of his brain and acting craft. Unlike most movie stars (especially from the action genre), he acted in experimental and improvisational plays off Broadway (like Another Octopus, Watching Fire (written by Jon Tindle) or Force Majeure) with the Ensemble Studio Theatre (EST) and his own theater company "Group Of Eight" started in 1994. He's also been taken acting lessons since his career debut (with Warren Robertson notably). In the past 15 years, Dolph Lundgren worked on some uneven productions, but he showed us some great improvement, with action flicks such as Russell Mulcahy's Silent Trigger, Sweepers, John Woo's Blackjack, Anthony Hickox's Jill Rips and the high concept thriller Hidden Agenda (directed by Marc S. Grenier). So while waiting that a director like Martin Scorcese gives him a try and a good part (as Quentin Tarantino did for John Travolta), Dolph Lundgren recently took up on directing his movies himself! He recently directed his fourth and fifth features Command Performance and Icarus, after having brilliantly made his directorial debuts with the action drama The Defender, The Mechanik and Missionary Man. None of the previous starring Lundgren's vehicles had been so tightly directed. 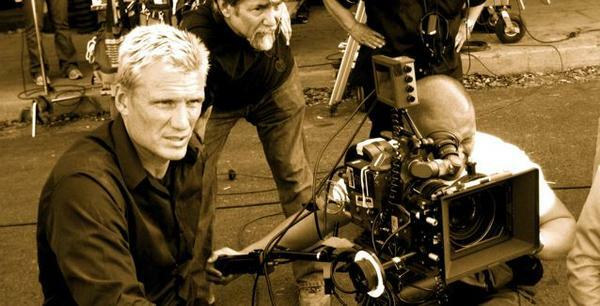 After having learned every filmmaking tricks on some more or less low budget action flicks, Dolph proved himself to be one of the best directors he's ever worked with and a talented director to follow. Now with a new Universal Soldier sequel and the big budget The Expendables, directed by Sylvester Stallone, Dolph Lundgren is on a comeback! In 2010, Dolph guest-starred in the season 4 premiere episode of the popular TV series "Chuck". Lundgren is now finishing his long planned fitness book, "Fit Forever" (to be published in Sweden in August 2011), while working a string of new projects filming back to back: "Small Apartments" a dark and quirky indie comedy co-starring Matt Lucas, Billy Crystal, James Caan, Peter Stormare, Juno Temple, Saffron Burrows, Amanda Plummer and JOhnny Knoxville; "Stash House", a thriller produced by Joel Silver co-tsarring Briana Evigan and Sean Faris; "Universal Soldier: A New Dimension" (3D) with Van Damme and also Scott Adkins; "The Package" with "Stone Cold" Steve Austin and "One In The Chamber" with Cuba Gooding Jr. Then Dolph shall join the all star cast of "The Expendables 2". He's also still developing and financing his own projects to direct, like "Skin Trade" or the WW1 period piece "Nordic Light". This site was created to serve as the ultimate guide to and the most comprehensive source of information on Dolph Lundgren, and is a tribute to this great actor/director. "Dolph is an intelligent man and a very kind human being." "Dolph is a real gentleman -- humble, friendly, professional, smart as hell, helpful and no "big shot" airs like a lot of stars I've worked with -- and everyone working with him has nothing but good things to say. Apart from his looks & talent, one of the reasons for his long and successful career is he leaves a trail of friends (not enemies) behind every project. " "Dolph was good to work with, he was directing as well and very open to suggestions, we got along very well together..."
"Dolph was always prepared and did an admirable job in the short amount of time." "Every change that Dolph wanted was born from his strong desire to push us all creatively and make the best movie possible. He's a perfectionist and it's demanding work keeping up with him, but in the end you have a product that you're proud of giving your time, blood, sweat and tears." "Dolph, I can truly say, is one of the few actors that really cares about what he does and how he comes across. He was extremely "on-hands" and played a major role in various re-writes and script changes. Now, we didn't always agree on every change and re-write, but his concern for the material was very refreshing." "Dolph is very nice, and he had very precise ideas for his film, which didn't keep him from listening to other ideas." "Shooting was great. 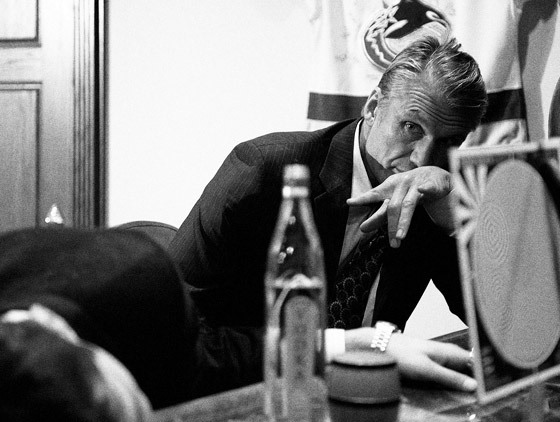 Dolph was very friendly and open to cooperation and fun to work with." "I am a fan of both Matt Dillon and Dolph Lundgren. I'd love to work with either of them in the future, though I currently have no plans to. " "I wrote a completely different script and was subsequently sent to Bulgaria with Dolph during the filming to do additional writing for the show. It was a great experience and Dolph was a great guy. After the movie ended Dolph and I stayed in touch and I ended up doing another rewrite for a movie he was going to do in Sweden called 'Still the Drums' "
"I enjoyed working with Dolph a great deal. He is a very nice person. He is kind, a humanitarian, helpful and very supportive. Not once during the whole production, did I see Dolph loose his temper. " "I've personnaly met and worked with Mr. Lundgren on many occasions for the last 3 years and I have to say that I haven't met a nicer person. He's a very intelligent and great individual with no ego or attitude whatsoever. He himself is aware that his films aren't that great however, he has a major following in Europe and the Orient and his films are steadily getting better (still not great, but better). Try not to knock someone you don't know and hell, if you were offered a million plus for 3 months work per film, would you refuse it even if the script was crap? Didn't think so." "I've worked with Dolph on the set of the movie "The Minion," I did some stunts and ssc work. I came to meet Dolph when he came to Montreal in the summer of 1995. I own a martial arts school and he began training at my school that summer and 4 times after, every time he's in town shooting movies. He and I got to know each other during his stay and we've been out to dinner a few times together. He had invited me to the set of his movies and from there got me into film work which I have been doing since 1996. Dolph is a very kind and well spoken man. He was great with my students and whenever he's in town I gladly give him the keys to my gym. We've talked about lots of things from film to training to his experiences with Stallone and Van Damme. He showed up on the set of the movie "Time Hunters" which I was doing fight choreography and acting and helped out with the publicity of it. If it wasn't for him, I wouldn't have made the contacts I now have."